You do not have to be too young to learn the piano. These private piano lessons are handy and relevant for persons of all ages. What’s more? All music styles can also be played on the piano. Taking private piano lesson is beneficial. It equipped you with skills which you may apply to other musical instruments. Apart from this, it also builds adaptability, dexterity, and confidence. Moreover, taking such lessons as well as the relevant music theory can also aid in improving your analytical skills. You are strongly advised to acquire a piano at home. This is to let you practice in between lessons in the comfort of your own home. Pianos exist in a variety of sizes and options. Moreover, they also come at varying budgets and costs. This means you do not really need a full-size grand piano. You may, in fact, buy an electric keyboard in the stead of a piano. Most piano lessons typically last 15 minutes to 2 hours. This mainly depends on the skill level of the respective student. It is recommended that these lessons take place on a weekly basis. This is to furnish the instructions and practice needed to build the skills. Additionally, you too will have to set aside some time in between the week to practice your skills on your own. You definitely have to possess an unquenchable thirst and passion for music. This is what shall give you the drive to practice well. Piano lessons are unique. This is to mean that they vary greatly from individual to individual. For this reason, most piano teachers do not adhere to a strict and uniform schedule as it may often interfere with learning. As such, most good teachers will normally work hand in hand with their students to develop lesson plans that closely mirror their unique needs. In some instances, the lessons can even vary from week to week as the skill and expertise of the students develop. The typical piano lesson comprises instructions on such issues as scales and the progression of chords. For these lessons to become a success, it is essential that you comprehend the building blocks. These constitute the music for the sake of learning more intricate skills. The key among these is how to move your hands up and down the keys to enhance your skills. Music theory is yet another fundamental skill that plays a great role in enhancing your musical skills. This being the case, good piano teachers spend much of their time inculcating the theory in order to help you in understanding the music. Some teachers may spend some time on music history also. Much of piano lessons will usually pay keen attention to the learning of new music. Inasmuch as learning these essential skills is important, it is also necessary that you learn how to play songs as well. Most other teachers will often pay keen attention to classical music whereas others like to inculcate popular music. As soon as you commence building your skills, you teacher may normally introduce sight reading to your lessons. This basically entails reading the songs by your sight. These songs are ordinarily not as complicated as the other collections. They are however great at building your skills and adaptability. You are strongly advised to a few times a week over and above your weekly lessons. The exact amount of time you should devote to your practice, however, depends on several factors. A young musician should spend no less than 15 minutes while those who are intermediates should spend between 45 minutes and 1 hour. 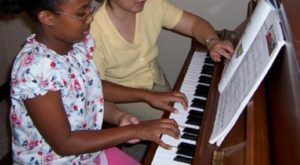 Piano Lessons instructors are highly experienced in teaching students of all ages and skill levels, and have been playing for the piano most of our lives. We have all undertaken a NSW Government certified “Working with children” police check. You will soon discover we are very friendly and patient with children to make students comfortable with learning at their own pace. We are qualified to teach all styles of music, whether you are interested in popular, contemporary, classical, jazz, or musical theatre. However, we encourage our students to explore all genres to show them just how interesting the piano can be. We are a network of Uni Students looking for piano tutor work. We offer you 1 on 1 home piano lessons for students of all ages and levels. If you are looking for an eager, professional and reliable piano tutor to come to your home, one of the tutors will be available. Our tutors provide you a very reasonable piano tutoring rate, that is a guarantee! Currently a student at the University of Technology, Sydney, Kayla is an eager, professional and reliable piano tutor who loves working with students of all ages. She has been playing piano for 14 years and have 3 years of teaching experience. Kayla loves to teach students about contemporary and popular music. Call her at this number 02 8007 3350. Please note this number will divert to Kayla’s mobile phone. Unfortunately she will not always be in a position where she can answer but please leave a message with student info and suburb.